Methylprednisolone is in a class of drugs called steroids. Methylprednisolone reduces swelling and decreases the body's immune response. 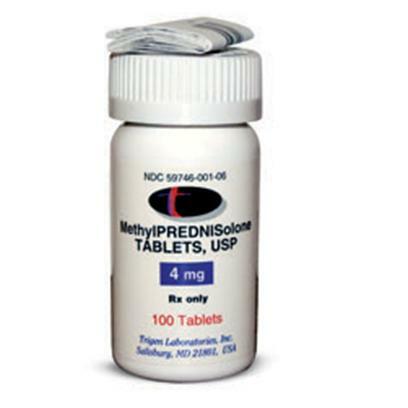 Methylprednisolone is used to treat many conditions including inflammation, lupus, allergy, asthma, colitis, and certain forms of kidney disease. Methylprednisolone may be used for purposes other than those listed. Methylprednisolone is the Generic Alternative to Medrol. Various side effects can occur. Be sure to tell your veterinarian what medications you are giving to your pet. Do not stop giving methylprednisolone suddenly if you have been giving the medication to your pet for a few weeks. A gradual reduction in dosage may be needed. Give methylprednisolone with food to prevent stomach upset. Give this medication exactly as directed by your veterinarian. Do not give more or less than your veterinarian has prescribed. If you do not understand the directions, ask your pharmacist or veterinarian to explain them to you. Allow plenty of water for your pet to drink. Give methylprednisolone with food to prevent stomach upset. Do not stop giving methylprednisolone suddenly if you have been giving the medication to your pet for a few weeks.